Ever since the announcement of Smash Run, the frenzy wildcard mode exclusive to the 3DS version of the new Smash games, we’ve been waiting for more exclusive gameplay modes to be announced for the Wii U, and Nintendo has always promised that they were on their way. 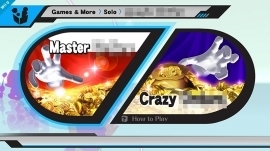 Yesterday, via Miiverse, Sakurai showed us a teaser image of the menu selection for a new part of the game, with a choice for “Master” or “Crazy”. Looking at the picture a little closer, you can see that the game is organized into the “Games & More” section of the menu; if you’re unfamiliar with the 3DS version, this is where other gameplay modes like Classic, All Star, and the Home Run Contest are found. Sakurai’s post just teases the existence of the mode, but doesn’t reveal anything about it; it seems he wants us to keep waiting for this one. What do you think it could be? Do the ominous “Master” and “Crazy” point to difficulty levels, or to something more complex?